Brigit of Kildare was one of the most popular saints in the medieval Gaelic world. The distribution of place-names commemorating her, and of churches and chapels dedicated to her, is far greater than that of almost any other saint. 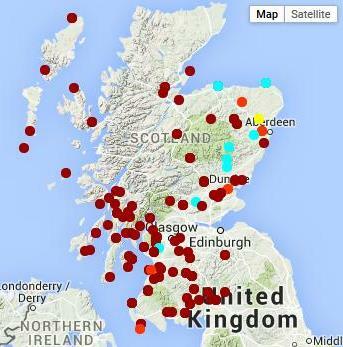 It is remarkable that in Cowal alone there were once four chapels dedicated to her. 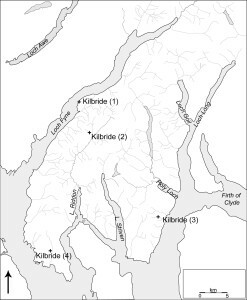 Only one of these remains (the ruined chapel shown as ‘Kilbride (1)’ on the map below which has given its name to a nearby farm), but the existence of three other places in Cowal called Kilbride show that there must have been three other chapels of Brigit. 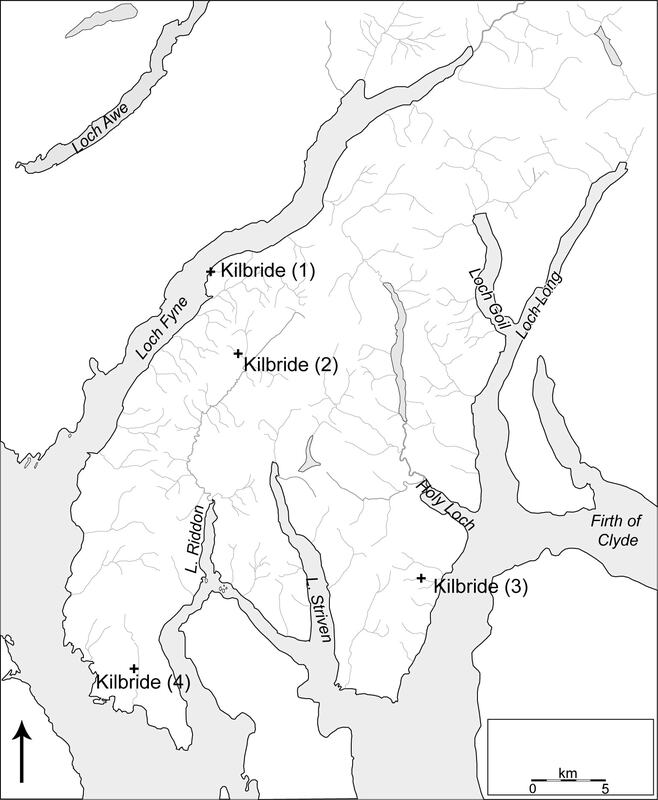 On one of these Kilbrides – the one to the south of Dunoon – the saint had a holy well, which you can still see, St Bride’s Well, beside the Episcopalian Church of the Holy Trinity, at the very edge of Dunoon [just follow a little path down the slope from the car-park]. In addition to the widespread distribution of her cult in most of Gaelic Scotland, there is also a large corpus of writing in her honour in both Gaelic and Latin: Lives, hymns and poems, as well as records of popular festivals on her feast-day. Her feast-day on 1st February coincided with one of the great ‘Quarter days’ of the year according to the Gaelic calendar, the feast of Imbolc – a feature of pre-Christian society in these islands, but one which continued to be celebrated in the Gaelic world throughhout the Christian period. It was associated with the end of winter, the renewed fertility of the earth and the green shoots of spring, with lambing and milk. It may be that the Christian commemoration of Brigit the nun and abbess of Kildare in Ireland reflects in some ways a pre-Christian cult of a goddess of the same name whose features were borrowed and became part of the imagery associated with the saint. But this is by no means certain. Many of the miracles associated with Brigit in her literary dossier were also associated with hunger and thirst being relieved by food and drink, with milk and cattle, with healing, and with calling into question the violence and military power of earthly rulers. Brigit was also celebrated in connection with women and childbirth. In South Uist the story was told that she was somehow transported to the stable in Bethlehem and waas midwife at the birth of Christ. Other stories had her as his foster-mother – Brighde Moime Chrìosd, ‘Brigit foster-mother of Christ’, and she is even called ‘the mother of Jesus ’ (in mathair Ísu) in one medieval poem attributed to Ultán. It is unlikely that anyone took literally the notion that she was ‘the mother of Jesus’, but the image of a saintly woman ‘mothering’ Christ evoked a certain kind of protective sanctity; and Jesus himself told his disciples that ‘whoever does the will of God is my brother, my sister, my mother’ (Matthew 12:50). 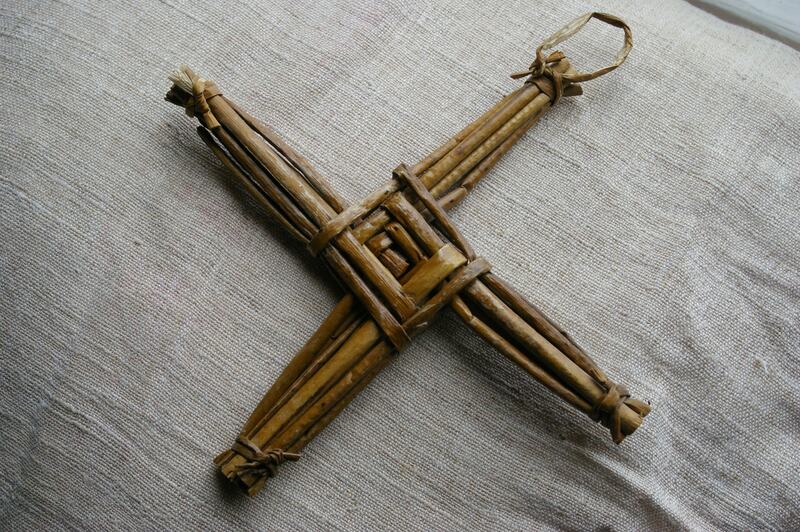 On St Brigit’s day, little crosses are made from straw. Brigit’s feast was celebrated by the Gaels until the twentieth century with a variety of popular practices: a straw cross might be made, or the figure of a woman or brideag made from straw or corn and processed around the house dressed in white. This saint’s popularity gave rise to a wide range of practices of this sort. There would be dancing, food and drink – which was shared with poor women of the place – and songs sung in her honour. Many practices connected the saint to new life, the birth of animals and children. Further reading: for the cult of Brigit in the Gàidhealtachd in the last couple of centuries, see Alexander Carmichael, Carmina Gadelica: Hymns and Incantations (Edinburgh & London, 1940), passim. Much has been written on the medieval cult, but a good place to start might be Thomas Charles-Edwards, ‘Early Irish Saints’ Cults and their Constituencies’, Ériu 54 (2004) 79-102. The earliest of her several Lives is the Latin one written by Cogitosus in the seventh century.